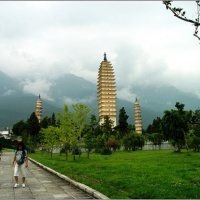 The three pagodas are situated in the Chongsheng Temple, north of Dali City, hence also known as The Tree Pagodas of Chongsheng Temple. 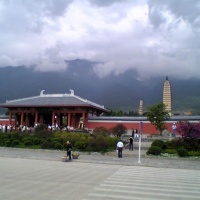 The three tall and ramrod pagodas stand at the foot of Lan Peak of Cangshan Mountain, making the landscape more beautiful and adding grandeur to the ancient city. 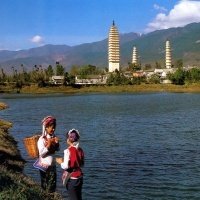 The major pagoda, Qianxun Pagoda, was built in the period 824 to 839 in the Tang Dynasty. It is rectangular in shape; 69.13 meters high and divided into 16 tiers, while the two smaller ones, octagonal in shape have a height of 42.19 meters each and 10 tiers. In 1978 discovered during restoration efforts, are more than 600 cultural relics of the Tang and Song dynasties, including Buddhist scriptures, Buddhist statues, Buddhist musical instruments and copper mirrors. The renovation was completed in December 1980.